Transform exciting characters from 30 thrilling years of Transformers! Each toy has 2 awesome modes! Set includes 2 individually packaged robot warriors. Transform your collection! For millions of years, Autobots and Decepticons have waged war against one another for control of Cybertron. 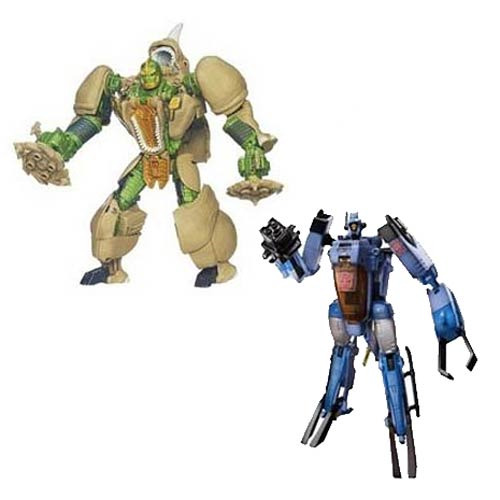 Today, you can bring home some of their biggest heroes with the Transformers Generations Voyager Figures! These exciting toys transform from a vehicle or creature to a robot that measures roughly 8-inches tall, and they feature amazing accessories like fantastic weapons and firing rockets. Get your Cybertronians now! Ages 5 and up.